In this year’s Q1 issue of the Clark Realty Report, we let you know about some of our biggest recent sales. 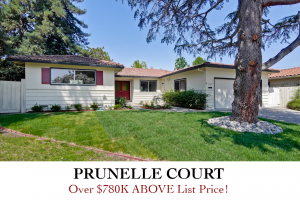 The centerpiece was our listing on Prunelle Court, which was listed for $1,688,000 and sold for over $780,000 above the list price! The sale was so incredible that it made headlines far and near, from local newspapers to national publications like the Wall Street Journal. But that was a few months ago. Are home prices still as hot now? This spring, the local real estate market made notable adjustments. Fewer buyers seemed to want to compete, so we didn’t see the frenzy of offers we saw in previous months. However, though we had less offers per listing in some cases, many of our listings still had multiple-offer situations, which drove prices high enough to match past sales. In essence, this means we saw less activity, yet maintained very high prices. We attribute this outcome to historically low inventory in our area. Plus, this year local tech magnates announced plans to expand into neighboring cities. Apple recently opened its second main campus, the state-of-the-art Apple Park, in Cupertino. In early 2018, Apple bought two large properties for another campus in North San Jose. Google is slated to install its own campus in Downtown San Jose, and Hewlett-Packard announced plans to relocate its headquarters to San Jose in late 2018. Of course, accompanying this expansion in and around our area will be thousands of well-paid employees seeking to live as close to work as possible. If inventory remains low, the increase in demand will very likely sustain our already-booming sales prices. Despite market adjustments, local real estate is still forging ahead at lightning speed. One of our listings, an atrium-style Eichler on Pulora Court, was listed at $1,968,000 this spring and sold for $2,350,000 in just 9 days! At the time of this writing, this is the highest selling price we’ve heard for a three-bedroom Eichler home in our area. This was followed by the sale of our listing on Sunset Avenue less than a month later. This adorable cottage sold for $2,333 per square foot! As a result, our sellers scored one of the highest price-per-square-foot sales in all of South Bay. Given current market trends, many clients have asked how we expect the market to hold up over the next months. Troy and I have worked in Silicon Valley real estate for decades. In our experience, we have learned this: nothing is predictable. That being said, we have both observed the staggering prices generated by high demand and low supply throughout our careers. As long as inventory stays low and local companies keep hiring and expanding, buyers will continue to shell out for a home close to work. In short, home prices remain incredibly high. So, take advantage of this year’s low, low inventory, and let our experienced team sell YOUR home for TOP DOLLAR!